Chiropractic is the detection and correction of a "Movement Deficiency Syndrome." Did you know that along with oxygen and fuel, movement is one of the key nutrients for the health of your brain? That's right, you see, our bodies were built to move - all the time. If you're not moving well, your brain does not process well. What happens if you take a day off and sit ALL day on the couch? Do you feel energized because you conserved your energy all day? Or do you feel tired? How about after you exercise? Movement creates a spark to the brain. Stimulation from proper movement is literally a required component of brain, nerve system, and overall health. Chiropractic recognizes the necessity of proper movement in the spine just as in all joints of the body. 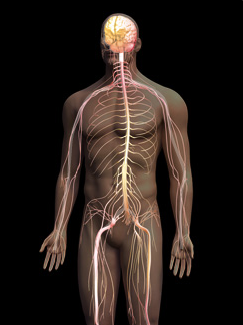 With every movement in the body, a signal is sent to the brain. With proper motion, the brain receives nourishing signals and moves towards health. If there is poor quality motion or lack of motion, the body sends stress signals to the brain. The brain receives these stress signals and appropriately responds by creating a state of stress in the body. When uncorrected, this process wears down the body creating a lack of health (which some call disease), this results in a decreased ability to live a full life, and finally leads to a premature death. Email Doctor Steve at stephenperry (at) gmail (dot) com to find a chiropractor near you to help you achieve optimal movement.